It’s safe to say that everybody loves music (see best apps) whatever genre one prefers over the other, there’s no denying that without music our lives would be bland and boring. Which is why some of us couldn’t live without our favorite earphones, but the days of tangled cables and our efforts and time spent on untangling them. The wireless earbuds are the latest trend in this space, also helped a lot in gaining momentum by Apple’s earpods. No wonder Samsung’s got a set of one of there own earbuds, dubbed the Gear IconX. But it’s not cheap, as it comes with a rather hefty price tag of $245.72. Given it may not pack all the features you may want, a design that pleases you, and more, including you, may simply want this experience on the cheap, it’s good to consider some alternatives to the Gear IconX. Here are top Gear IconsX alternatives that you can use with any Android phones and iPhones out there. We have carefully picked 12 of the best Gear IconX alternatives for you. So you can get rid of the tangled mess and listen to your music unplugged. Although these buds aren’t truly wireless like the Gear IconX, the only wire present is the one connecting the two sides of the earbuds. The SoundPEATS wireless buds offer the best bang for your buck, with a price tag of just $28.99 these buds offer good quality audio with great lows and a balanced high and mid-end. The SoundPEATS also come with about 7-8 hours of battery life which is good for the prices it’s offered at. Additionally, the buds do also come with an IPX6 rating which means you could use these buds while working out and not worrying about ruining them with sweat. The buds do have magnets towards the backend which let them rest comfortably around the neck without the worry of them falling off. These buds give some serious competition to the Gear IconX by offering a lot of useful features of which some aren’t even available with the Gear IconX. At the price of $189.99, the Jabra Elite offers superior sound quality and a bunch of other features such as workout tracking as it is equipped with a motion sensor. The buds even come with Alexa enabled and offer ‘One-touch’ access to Google assistant or Siri. The buds also come with the charging case as well so you would not have to worry about losing them as you could toss them back in the case after using them and let them charge back up. 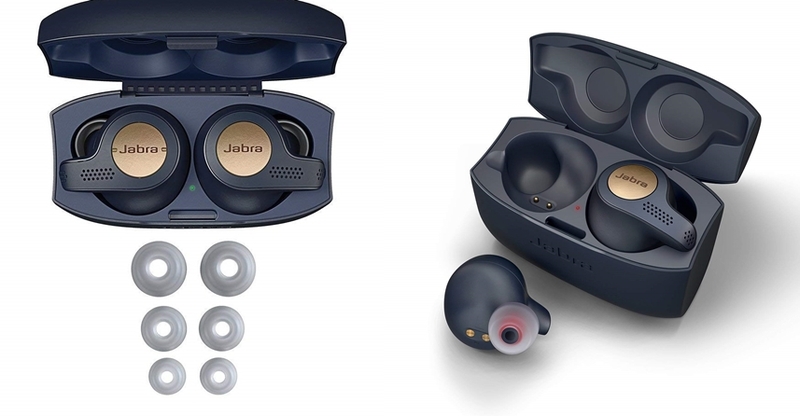 If you are willing to spend around $200 on a pair of wireless buds, the Jabra Elite Active should be one to consider. You have probably heard of Anker, the company produces terrific power-banks and smartphone accessories. The Soundcore Liberty Lite’s are no slouch too. Coming in at a price of $79.99 these make them one of the cheapest truly wireless buds you could get while also being assured to get a good quality product. 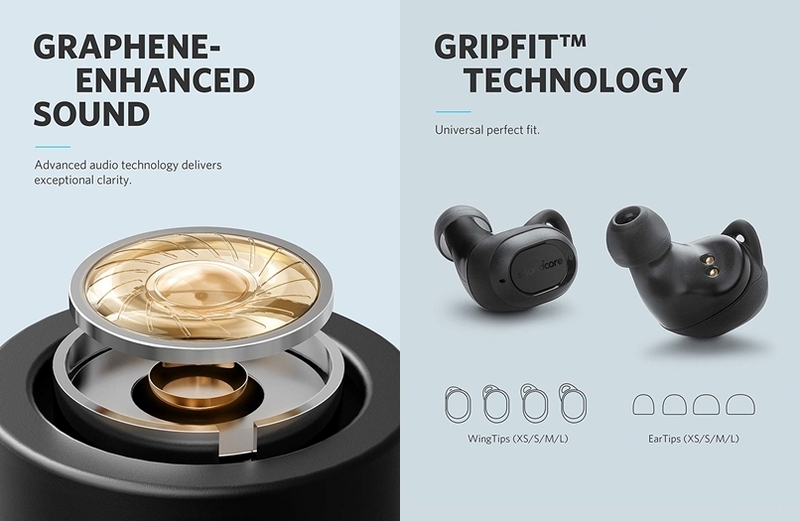 Anker claims that the earbuds have exceptional clarity delivered via Graphene drivers with deep, resonant bass. Though, we would not use those words to describe it. Rest assured for the price of these buds the audio quality is great indeed. Once paired to your device the first time the next time you pull out the buds from the case they would automatically connect to your device. The battery life on the Soundcore Liberty Lite should last around 3-4 hours and does also come with a charging case which could charge up the earbuds three times when unplugged as well that gives you around 12 hours of battery before you have to plug the earbuds along with the case in a power outlet. The Zolo Liberty+ is currently available at a price of $99.99 which is a quite a deal. Here’s why. These buds offer Zolo’s PUSH AND GO feature which ensures ultra-fast pairing between devices. They also are only of the only few buds to have Bluetooth 5.0 which means there is almost no audio delay while watching videos. The Zolo Liberty+ also offers 3-4 hours of battery life like the Soundcore Liberty Lite, however, the included charging case provides it with 48 hours of extra battery backup without the need to plug it into a power outlet. These buds also do provide a good level of sound isolation which enhances the listening experience, but also allows the users to touch a button and allow the users to listen to exterior sounds with the help of its external microphone is situations where one must be aware of their surroundings. These truly wireless earbuds are definitely worth your money as they offer a ton of features while being slightly affordable. The Apollo 7 earbuds are one of the sleekest and lightest truly wireless earbuds you could buy right now, weighing in at only 4 grams these buds are great for those who aren’t comfortable with slightly bulky and heavy earbuds. These buds have on of the best designs of all wireless earbuds while also providing a balanced audio profile for a price of $149.99. The included charging case can fully charge the earbuds twice while on the go. The Apollo 7 also comes with an IPX5 rating which makes it waterproof and could be used while at the gym or while in the rain. The buds also come with an omnidirectional mic which allows users to answer phone calls and interact with Google Assistant or Siri. 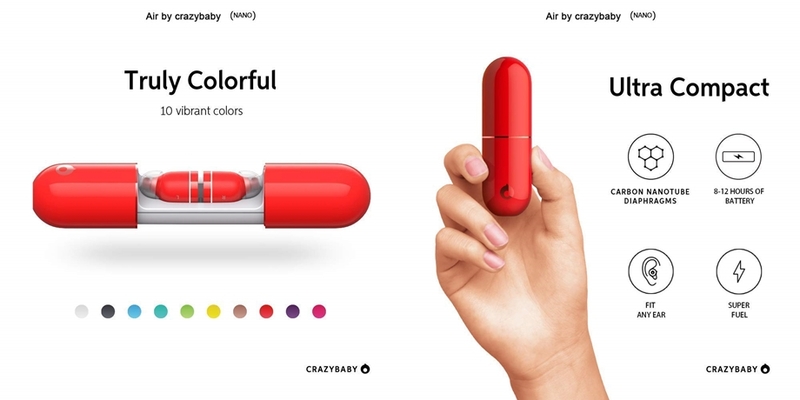 The Crazybaby Air Nano is available at a price of $99.99. These buds come with a cool pill shaped charging case which is quite unique although the quality of the case isn’t up to the mark. However, the case does a have the latest USB type C charging port which isn’t common with most wireless earbuds currently. 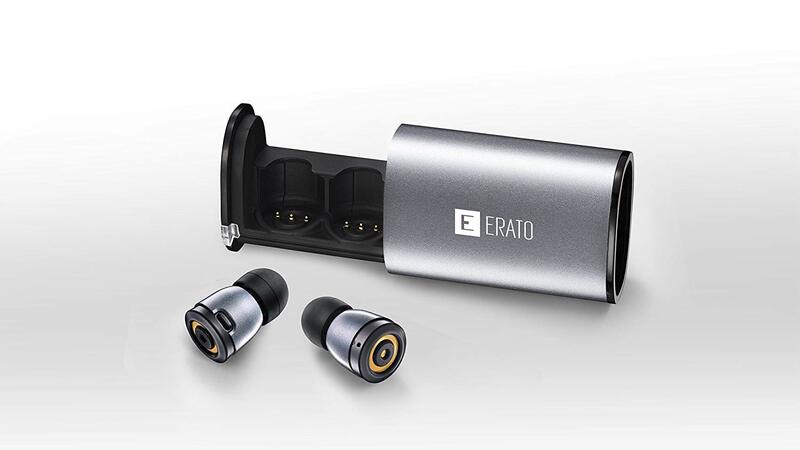 These earbuds are quite small and offer about 1-2 hours of battery life. The Crazybaby Air Nano sits comfortably in the ears but usually tend to fall out while running. The sound quality offered is decent for the price with a good amount of bass and great clarity. At a slightly high price of $199.99 the Bose SoundSport Free wireless headphones offer the best audio quality and could be compared to other high-end wireless earbuds like the Gear IconX. These buds come with sweat and weather resistance with an IPX4 rating. The battery gives about 5 hours of playtime while the charging case gives an additional 10 hours of playback. The Bose SoundSport Free wireless buds have StayHear®+ Sport tips on each lightweight earbud stay comfortably and securely in place all workout long. The buds could also be tracked if misplaced or lost with the Bose connect app. If the best audio quality is what you want, the Bose SoundSport Free wireless headphones should be your go to truly wireless earbuds. There is almost no competition for the Jaybird X3 Sports earbuds at when it comes to bang for your buck. The buds are available at the price of $124.95. These earbuds aren’t truly wireless but have only a wire connecting the two earbuds. The silicone ear fins securely attach to the top and back/lower surface areas of the ear for a snug fit, locking the earbuds in during workouts and intense physical activities. Includes multiple sizes of silicon and Comply tips for maximum noise isolation, fit, and comfort. These buds do come with an 8-hour battery life and the MySound App allows you to tweak and customize the sound of your X3 headphones for a personalized experience, and save them for later as a profile. The audio quality is better than most other alternatives mentioned. Another pair from Jaybird, however, these are truly wireless earbuds which means its completely free of cables. The Jaybird RUN offers good audio quality with a balance of bass, mids, and highs. The battery lasts for 4 hours of playback time and the charging case provides an additional 8 hours of playback. The Jaybird app can help you locate your buds if they go missing. At the price of $150.87 currently, these earbuds are a great option if you’re looking for truly wireless earbuds. Finally, we have a pair of truly wireless buds from Sony on the list. Sony has a reputation for providing some of the best audio experiences at an affordable price. The Sony WF1000X comes in at $198.00. These wireless buds by Sony offer great audio quality with crisp and clear sound. This is about as good as you can get currently with the audio quality of wireless earbuds. Battery life is around 9 hours with the included charging case. The buds do come with digital noise canceling which lets you tune out the outside world and enjoy your music uninterrupted. The buds also automatically detect your activity, whether you’re traveling in an airport, walking on a crowded street, or sitting in a quiet area then balances the noise canceling levels accordingly. You can customize them to your preferences with the Sony Headphones Connect App. If you’re on a really tight budget this Gear IconX budget alternative should be taken into consideration. The Otium Wireless Sports earphones will cost you just $19.97. At this price, there is nothing about these buds that you could complain about. They offer good audio quality as well as come with an IPX7 rating which is just great at this price. It would not be damaged by sweat or rainwater hence, you could be carefree with them while out jogging or at the gym. The earbuds come with a battery life of up to 8 hours and do support fast-charging. The earphones do come with a microphone as well so answering calls wouldn’t be a problem. Much like the previous earbuds this budget-friendly alternative to the Gear IconX also offers the best value for money. With a price tag of $19.98, it’s hard to find any fault, neither with audio quality nor with the build quality. The Letsfit Sports earphones come with a neckband design which lets the buds rest around your neck when not in use. The battery life is about 8 hours too which is great. These earphones also have noise canceling to block out any background noise. Although the noise canceling isn’t as good as the Sony Wf1000X, not that we’d expect it to be as good. However, for such a low price these earphones definitely are worth taking a look at. Do let us know which truly wireless buds you’d pick in the comments down below.